The late Wolf Rosenberg, sired two male cubs-George and Bill. I'll profile No 1 cub, George, first. George Rosenberg was educated at Christchurch's decidedly non-proletarian Christ's College. He spent a year at Canterbury University before heading, in the late '60s, to Wellington's Victoria University to study law, . 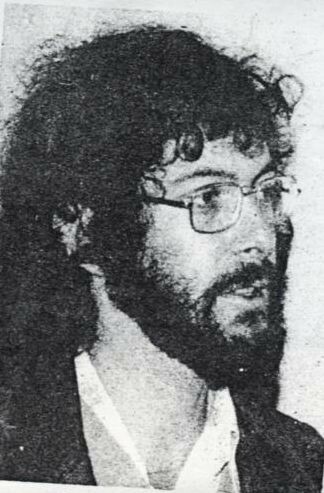 In 1969/70, George Rosenberg was active in the Victoria University Socialist Club and was managing editor of its journal, "Red Spark". The VUSC was the crucible of the Trotskyist Socialist Action League, but also seemed to contain some Maoist elements. Certainly, young George, was far more aligned to the Maoist camp. In 1969, he was a founding member of the Wellington Progressive Youth Movement. Though it contained also contained Trotskyist and anarchist elements, the Wellington PYM was predominantly Maoist in orientation. Like other branches, it was loosely aligned to the Communist Party. A prime movers of the Wellington PYM, was Sally Lake, daughter of "security risk", former diplomat Doug Lake. The three Lake sisters, had all allegedly been in the Chinese "Red Guards" in the mid'60s, while their father was in Beijing, writing propaganda for the Chinese government. The Lake's family friend, Tom Poata, was assigned to keep an eye on the PYM for the Communist Party. Of the three main branches of the PYM, (Auckland, Wellington, Christchurch), Wellington was the shortest lived. The entire Wellington branch of the Communist Party was expelled in 1970 over a doctrinal dispute. The local PYM collapsed soon after. In August 1970, George Rosenberg was on the convening committee of the 2nd Radical Activists Congress. Held in Wellington and sponsored by the Vic Socialist Club, this was a nationwide gathering of Maoists, Communists, Trots, Anarchists, peaceniks and hippies. Among the fascinating debates, was "Maoism or Trotskyism, which way for the Revolution in New Zealand?" arguing for Trotskyism was Keith Locke of the Socialist Action League-for Maoism, Ray Nunes from the Communist Party.. In 1971, Maoist elements around the NZ University Student's Association, organised the first of several student delegations to the People's Republic of China. Most if not all, of the 20 delegates were Maoist sympathisers. Delegates included David Caygill (deputy leader, future Labour deputy Prime Minister), Piri Sciascia (now pro vice-chancellor, Victoria University) Cora Davis (Nga Tamatoa), Tim Groser (now a National MP) Ah Fo Wong (Maoist), Mike Law (Maoist, now at Waikato University), Graeme Clarke (Maoist, later leader of the Workers Communist League) and George Rosenberg. By 1972, Rosenberg was flatting in Wellington with his anarchist, ex PYM flatmate Roger Cruickshank (lately a "time and motion" man for a Sydney bank!!!). Rosenberg was heavily involved in the Tenant's Protection Association and the Wellington Resistance Bookshop, a Maoist/Anarchist venture. After qualifying as a lawyer in 1973, Rosenberg became a law clerk for Shirley Smith, the wife of Wolfgang Rosenberg's old friend, WB Sutch. When, in 1974, Sutch was put on trial for passing information to the Soviet Union, Rosenberg became heavily involved in his defence. Together with Amanda Russell (a Maoist and Rosenberg's future wife), Don Borrie, Roger Steele (a Maoist), Roger Cruickshank and others, Rosenberg set up the Sutch Defence Fund. After Sutch's aquittal, this morphed into the Campaign Opposed to the Security Service (COSS) and then into OASIS-Organisation Against the Security Intelligence Service. OASIS was mainly a Maoist organisation. During the mid '70s, Rosenberg worked for the Consumer's Institute and was very active in the Council for Civil Liberties. Amnesty Aroha, an organisation set up to protect Samoan "overstayers". During 1981, Rosenberg was a leading activist with Wellington's Citizen's Opposed to the Springbok Tour, an organisation completely dominated by Maoists and/or Workers Communist League members. In 1982, George Rosenberg and George Barton successfully took a case to London's privy Council that gave thousands of Samoans, full NZ citizenship. By the late '80s, Rosenberg was a lawyer for the Hong Kong government, working on Vietnamese immigration issues and the new Airport project. In recent years he has been working around Europe for a large law firm, specialising in construction and engineering disputes. Has George Rosenberg "sold out"? If he is his father's son, I very much doubt it. You do need to rid yourself of this sometimes dishonestly manifested obssessiveness about commies Trev. It causes you to advance a rather questionable gloss on simple little old things. Misleading. Disappointing in a man of your intelligence.